It’s a new year and that means new fashion trends in the women’s clothing world. Let us here at Pinecrest be your personal stylist for the year and make it your best dressed year yet. At Pinecrest, we offer the newest trends and styles in women’s clothing. For 2019, we’ve already got the newest styles in store. Try out something new or find something you’ll love with one of these looks. This red SEN sweater is comfortable and warm but offers amazing visual interest and a flattering shape. It features multiple kinds of knitting designs to create an interesting look. The slouchy shape is flattering on many body types as well as being comfortable. We’ve paired it with jeans and classic black booties for a look that can go from work to out with friends or even a weekend party. This Chenille sweater offers a fun twist on a classic sweater shape. This off-the-shoulder look is unique and interesting while the rib knit is warm and cozy as well. You can pair this sweater with a fun necklace or a scarf or just let it stand on its own. We’ve paired it with classic blue jeans and knee-high boots for a classic stylish winter look. This outfit can take you through many occasions from brunch with friends, shopping or even a weeknight date. This third look is sure to turn heads. 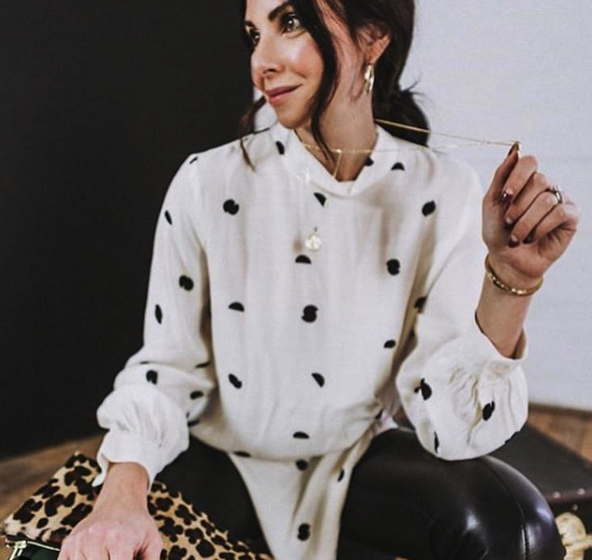 This ASTR the Label Dalmatian Print Top is bold and beautiful. The fun polka dot pattern can help shake up a stale wardrobe. The puff sleeves and high neck are conservative but chic, so this top can be worn in the office or to an important meeting. Pair this fun top with a long or short necklace or even fun, dangly earrings. The long length can comfortably pair with leggings, joggers, or your favorite skinny jeans, but still look put together. The bold patterned top makes an impact. You’ll be the most stylish one in any room you enter! Women’s clothing trends in 2019 are all about fun silhouettes but comfortable looks. Style no longer has to be sacrificed for comfort. These longer length tops and sweaters are comfortable on their own but pair with leggings or jeggings and you’re sure to look chic and ready for anything. New shapes and cuts offer interest and variation to a wardrobe in need of a refresh. Women’s clothing styles are offering something for everyone and for any occasion. At Pinecrest, we can be your women’s clothing personal stylist for 2019 and beyond. Let us style you for all occasions you’re planning to attend this year. Don’t be afraid to try a new look, shape, color or accessory. We are here to help!